Well, it’s been three months since I made the goal to do a drawing a day. So far, I’ve missed plenty of days to say I’ve missed that goal, however, I’m still drawing more than I have in years and I’m continuing to stretch my comfort zones in the process. As I stated before, I had dug out old comic books from my early teen years and have been practicing drawing some of my favorite covers and panels. Recently, I tracked down one of those artists who worked on the G.I. Joe comic books in the early 90s and found some more recent sketches from the artist online. His name is Andrew Wildman and he often signed his work as just “Wildman.” — wonderfully expressive stuff with eye-popping detail. I found two sweet sketches he’d done of Optimus Prime online — one was in color, one was not. So I drew the black and white one in pencil, went over it in color, using his other colored drawing as a reference, and went over it in ink. I’m quite happy with the result. I’ve invested in a set of Prismacolor Premier markers (and got most of them as a birthday gift this year! ), and as I work on my latest sketch — a marker drawing of the Transformer Hot Rod — I’m practicing blending and layering shades and colors. It’s great fun and I find myself anxious to get to drawing again before the day’s end these days. 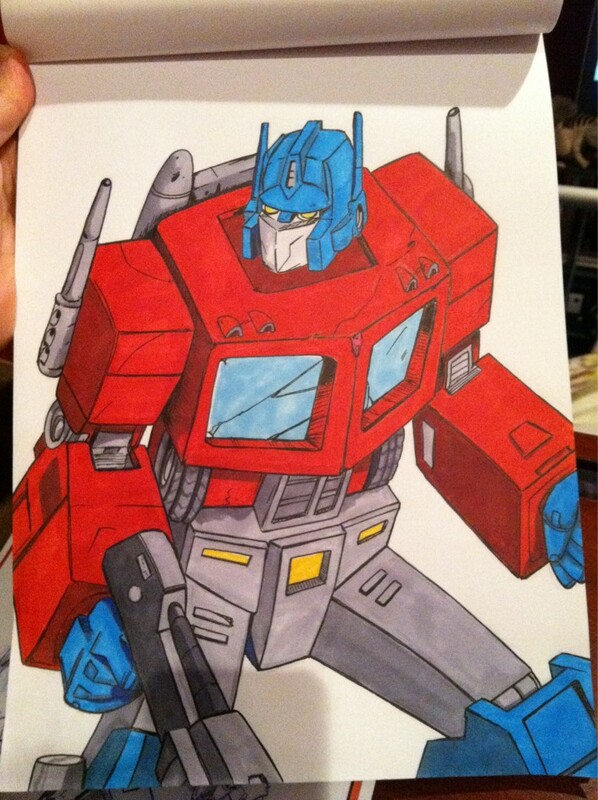 Here’s the Optimus drawing I mentioned above. It was done on a Canson Marker Pro Layout pad. I can’t wait to keep trying new approaches!